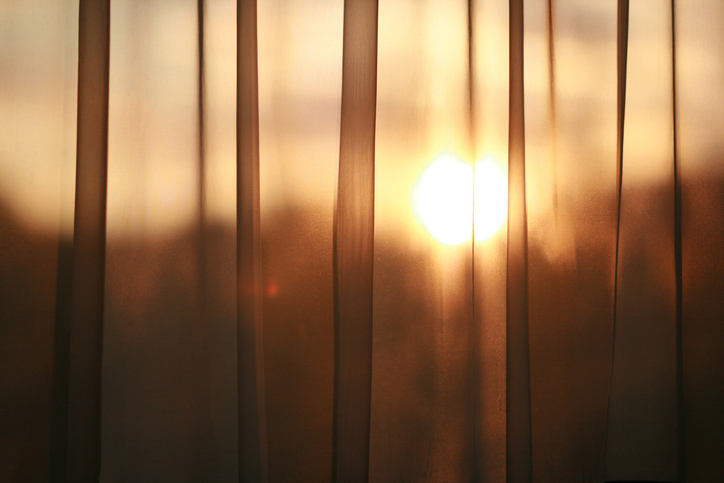 These curtains are sheer; you can see through them. When we say something is sheer, we mean that it’s so thin that it looks almost transparent. Sheer also means ‘absolute’ or ‘utter‘ and ‘extending up or down very steeply.’ As an adverb, it means ‘vertically’ or ‘steeply,’ but also ‘quite’ or ‘completely.’ An unrelated verb meaning is ‘to move away from a course,’ and it’s used in particular as a nautical term. Philippa prefers sheer tights to opaque ones. You want to hike across the Australian outback alone and you're only taking one bottle of water; that's sheer madness. Brad looked up at the sheer cliff face and knew he would never be able to climb it. The stone dropped sheer to the bottom of the cliff. Helena vaulted sheer over the gate. The boat sheered to port. In Persian, sheer means ‘milk’ and sheer khurma or sheer khorma is a dessert prepared by people in Afghanistan, India, Pakistan, Bangladesh, and parts of Central Asia. If you feel like testing your cooking skills at the same time as your English skills, see this recipe in English. Sheer dates back to the late 13th century. The Old English adjective scīr (clear, pure, or thin) became the Middle English scere, shere or schere, and the meaning widened to ‘free,’ ‘clear,’ ‘bright,’ and ‘thin’ as the initial “sk” sound became “sh.” It comes from the Old Norse skǣrr, which can be traced back to the Proto-Germanic root skeran- and the Proto-Indo-European root (s)ker-, meaning ‘to cut.’ It is related to the German schier, the Old Norse skīr, and the Gothic skeirs, all meaning ‘clear.’ It shares its origin with another English word: shine. The meaning of ‘absolute,’ ‘utter’ was first used in the late 16th century, but the adjective only came to mean ‘very steep’ around the year 1800. The adverb comes from the verb. The verb sheer, meaning ‘to deviate from course,’ dates back to the early 17th century, and probably comes from the Dutch scheren (to move aside), even though it shares its original roots with the adjective. The noun with the same meaning comes from the verb and was first used in the mid-17th century.